MUMBAI: Flock, an enterprise communication and collaboration app for teams designed to enable people to get work done faster, conducted a survey to understand consumer perception and how it has helped its users to move away from traditional ways of communication and increase productivity at work. Enterprise messaging tools and services have garnered a lot of interest and are witnessing increase in adoption in the Indian workplace, as a superior and a unified way of communication. 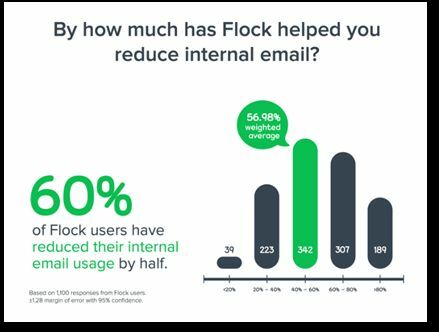 Flock says that the recently conducted survey on over thousand respondents depicted interesting results showcasing the adoption of enterprise messaging app across industries and functions. When questioned about enterprise messaging apps replacing internal email, 60% of the users said to have cut down their email usage by half. Also, the study indicates that 40% of Flock users have reduced in-person meetings by half. Also, when questioned on productivity, the survey projected 7 out of 10 users witnessed at least 20% increase in their productivity post the adoption of Flock. Flock says that the company is striving consistently to redefine the manner of communication in day-to-day work life. The recent launch of its App store enables users to connect external work apps and services that they frequently use, directly into Flock. Flock App store allows integrations with external work apps and services apps such as Trello, Github, Twitter, Jira, Bitbucket, and many others. Flock is the perfect communication tool for fast moving teams and organizations. It is available for download for iOS, Android, Windows, Mac and Chrome. Enterprise messaging app gains popularity; app replaces email, in-person meetings by half 0 out of 5 based on 0 ratings. 0 user reviews.